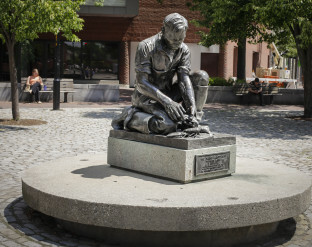 Frederic E. Boothby, Portland Mayor from 1901-1903, installed a watering trough at one end of Boothby Square Park in 1902 to commemorate the philanthropic work of his wife, Adelaide. 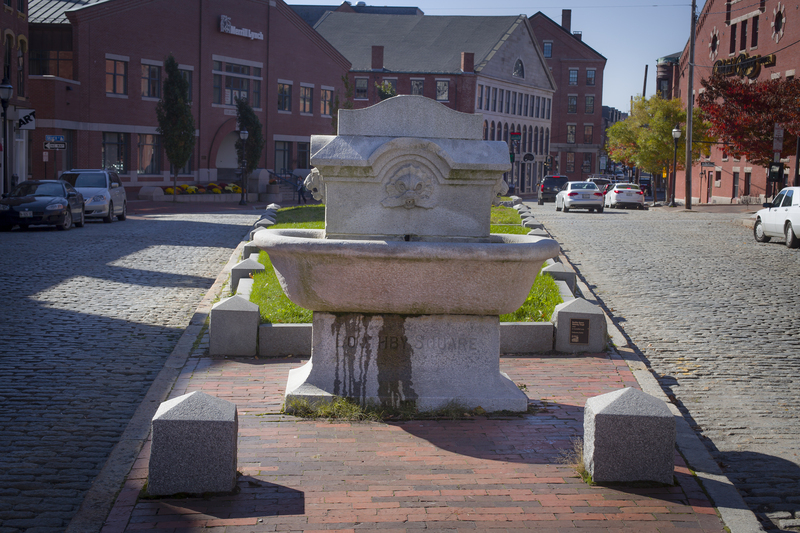 Water was in constant need, and public watering troughs were established and used by both “Man and Beast.” The watering trough at Boothby Square was used to water horses and dogs and goats. The “City Beautiful” movement also felt strongly that public fountains encouraged contemplation and respite from city life. 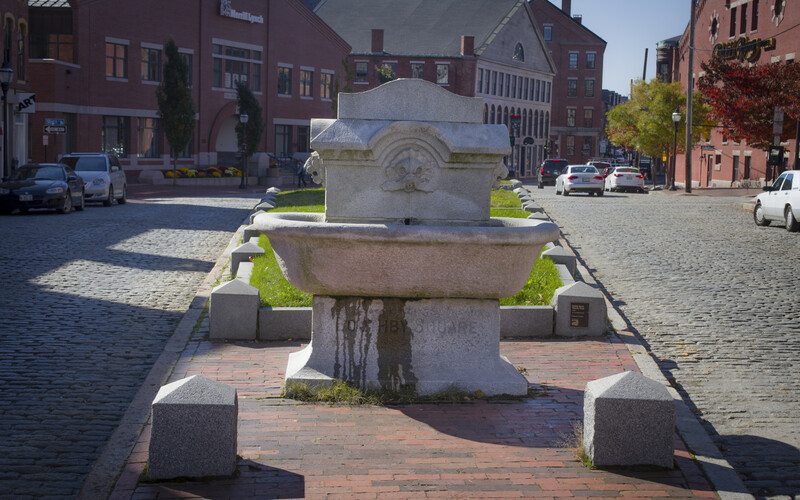 Located at an intersection and in the middle of Fore Street, the Boothby Square Watering Trough was very exposed to traffic, and in July 1946 it was struck by a car with enough force to knock the trough off of its base and break off the ornate piece that once stood on top. Soon it was deemed a traffic hazard and along with the base was carted off to one of the city’s storage areas. There it sat, out of view and pretty much forgotten for twenty-five years. Boothby Square suffered a similar fate, turning into a simple unadorned grassy strip in the middle of the street. In 1983 antiques dealer William Johnson bought the trough and set it up on his property in Wells. 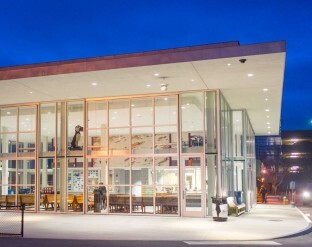 The publicity around the sale caused renewed interest, and several attempts to buy it back were turned down until 2004 when Mr. Johnson finally accepted an offer for $50,000. The money was provided by a Libra Foundation grant and a group of donors headed by Eric Cianchette. Cianbro Corp. donated labor and equipment needed for the site work and reinstallation of the watering trough. The watering trough now has a small protective island, and is guarded by short granite posts to help prevent any future traffic mishaps. Very little re-plumbing was necessary as the original piping was mostly intact when the trough was returned to its place at the end of Fore Street. It is a working trough with two levels, one for horses and another for dogs. 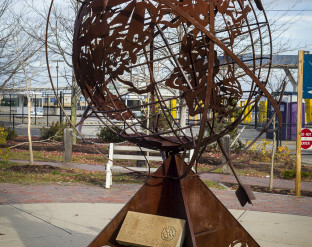 A simpler flattened stone has replaced the granite dome-like piece that once stood on top but otherwise it has been restored to its original state and re-entered into the Portland Public Art collection in June 2005.